“No social movement has ever succeeded without the people involved being part of it,” Joel Berg, executive director of the New York City Coalition Against Hunger commented to the Philadelphia Inquirer this week. He was talking about the significance of Witnesses to Hunger, a program at the Drexel University School of Public Health that celebrated its fifth anniversary this week – and is built around exactly such participation of the people involved. 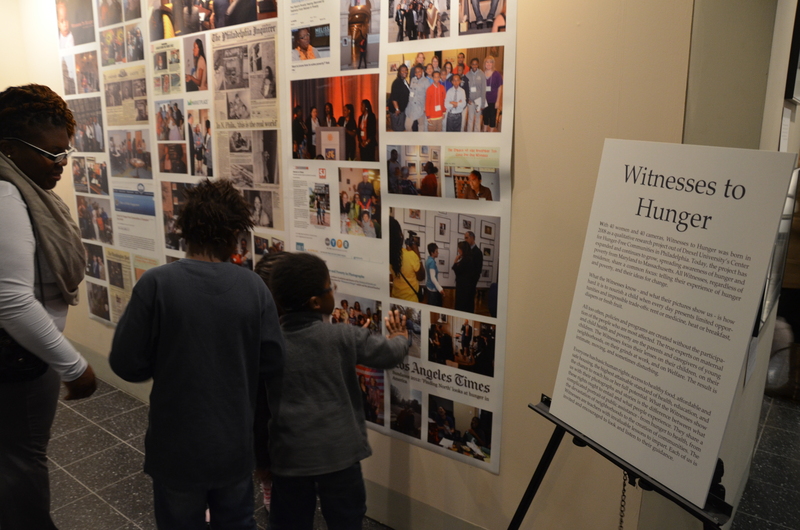 Tianna Gaines-Turner, a Witness to Hunger from Philadelphia, shows her children an action wall depicting Witnesses’ experiences speaking in public, with legislators and through the media. “Witnesses” began in 2008 when Mariana Chilton, PhD, an associate professor at Drexel, received an open-ended grant to do anything she wanted to build upon her research addressing child hunger and poverty. She was already working as the lead investigator in Philadelphia for Children’s HealthWatch, a major multi-site research program that helps quantify the impact of policies and public assistance programs on children’s health. Chilton realized that participation was what was missing. Quantifying impacts wasn’t enough on its own. She had plenty of numbers about how much programs like food stamps helped children’s healthy development, but when she testified about those numbers as an expert witness for state and federal legislators, they didn’t appear to sink in. Witnesses took photos of their lives and communities, both as the basis for helping others understand the root causes of hunger, and as a way to advocate at the local, state and federal level for changes to end poverty. Their photos tell a story about hunger that is about much more than just food. They link housing, homelessness, safety, education, entrepreneurship, wages and public assistance to create a comprehensive picture of the complex underpinnings of a system that should offer people a hand up out of poverty – but doesn’t always work that way in practice. In five years since its founding, the Witnesses to Hunger program has expanded to five more sites across the East Coast, and more than 80 participants. Witnesses have worked together advocating for improvements in policies and programs that directly affect their lives and communities. They have spoken in public and on the national media stage. Boston Witness Juell speaks, surrounded by other Witnesses and their families. Through the process, Witnesses have also formed a kind of family. More than 30 women and men of Witnesses reunited for the anniversary event– filled with hugging, cheers, laughter, dancing and playing children. More than a few tearful moments ensued – happy tears from reflecting on all they have accomplished, and painful tears at struggles that still remain, and especially at the loss of a beloved Witness who recently passed away following illness. This brother- and sisterhood the Witnesses have formed is more than a warm and friendly side effect of their work together. When you listen to the Witnesses describe their experiences, it becomes clear it’s an integral part of the program’s success: The strength in numbers of being part of a group has empowered the Witnesses to raise their voices together and speak about issues that too often go unspoken. 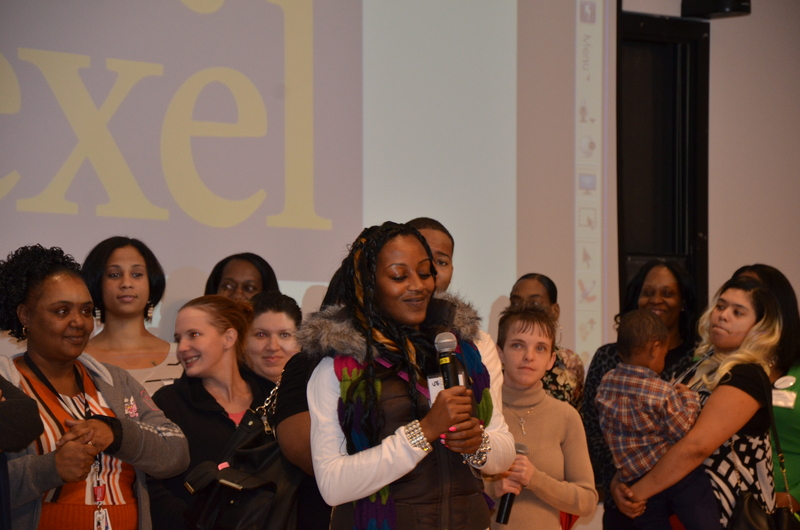 “I knew I wasn’t alone in telling my stories,” said Juell, a Witness from Boston, at the anniversary exhibit. In its first five years, the Witnesses to Hunger program has grown and expanded, and that growth is not complete. At the anniversary event, Chilton announced that the next Witnesses site is about to begin in Sacramento, Calif., in partnership with the Western Center on Law & Poverty. Women and men in Sacramento who have struggled with poverty firsthand, will soon have the opportunity to take up cameras in their own community and join in the movement of Witnesses as public educators and advocates for change. To learn more about Witnesses to Hunger and view their photos and testimony, visit the website of the Center for Hunger-Free Communities in the Drexel University School of Public Health or watch the story about the anniversary from NBC Philadelphia.